The short answer is “yes.” In fact, according to experts, it is best for babies to avoid prolonged sun exposure altogether, if possible. When exposed to direct sunlight, you should use sunscreen on all exposed areas, paying particular attention to vulnerable areas such as the head, neck, and shoulders. Sunscreens must be reapplied periodically for maximum effectiveness. How often they must be re-applied varies by product, so be sure to read the package directions and follow them carefully. Keep in mind that when children are playing in the water, sunscreen may need to be reapplied more frequently. 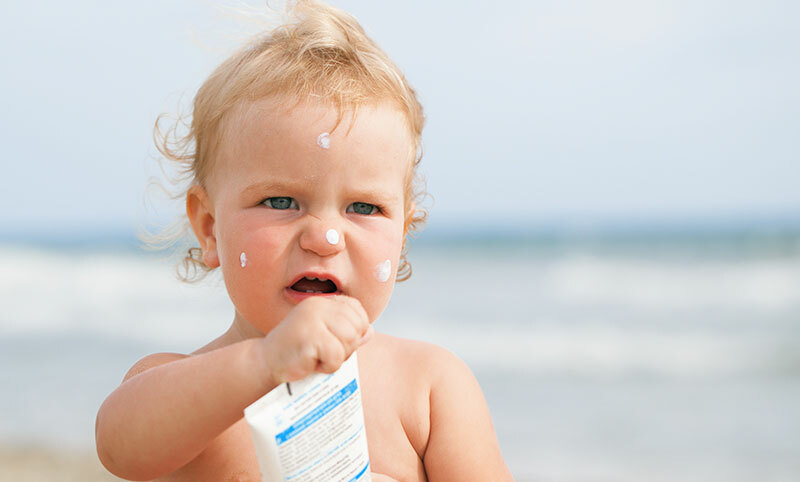 What kind of baby sunscreen should you choose? Babies have sensitive skin that can’t handle the same chemical compounds that the skin of adults and older children can. For this reason, it is advised to use a mineral-based sunscreen for infants, particularly those under the age of six months. Mineral-based sunscreens will contain titanium dioxide and/or zinc oxide which stay on top of the screen rather than be absorbed by it. Look for a mineral-based broad-spectrum sunblock with an SPF (sun protection factor) of at least 30. Broad-spectrum sunscreen protects against both UVA and UVB rays. The sunscreens that work best are waterproof and have a UVA rating of at least four stars. Many products that are suitable for infants are organic and contain no artificial colors or fragrances. Some contain natural moisturizers such as sunflower oil, olive oil, beeswax, and aloe vera. For newborns, products with artificial fragrances may be unsuitable. Pay attention to any age recommendations that may be on the packaging. Look for products that are specifically labeled as being for sensitive skin when choosing a sunscreen for newborns. Be careful when applying sunscreen on a child’s face, especially around the eyes. Wipe your child’s hands with a damp cloth to prevent them from getting it in their eyes when they rub them. Don’t forget to protect your child’s eyes from the harmful sun. Be sure to read about protecting children’s eyes with sunglasses.